- One Piece - The Movie: Years after his disappearance, The legend of the Great Gold Pirate Woonan and his hidden treasure map remain. Many pirates search for his mountain of hidden gold on a remote island. Among them are Captain El Drago and his men who have taken possession of a map to that hidden island. On their way there, they meet and decide to rob the Straw Hat Pirates, who, still lacking a cook, are close to starvation. Our heroes, Luffy, Zoro, and Tobio survive and go on the hunt, hoping to beat Captain El Drago and his crew to the treasure horde. Will Luffy and his crew find the treasure in time? And will they find a cook for their ship before they all starve death. And what is oden and what does it smell like? - One Piece - The Movie 2: The Adventure Island Clock : While the Straw Hats enjoy a warm day at the beach, their ship with all their equipment and weapons is stolen. 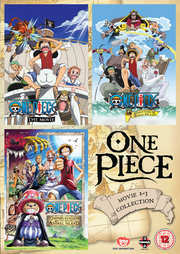 As Luffy and his fearless crew mates go in search of their beloved ship they will encounter the mysterious Thief Brothers and embark on a whole new treasure hunting adventure. The quest for the fabled Diaomond Clock from Clockwork Island. - One Piece - The Movie 3: Chopper Kingdom - Strange Animal Island : With Chopper as their newest member, the Straw Hats arrive at the Island of Strange Animals. Before they can land, a geyser-like fountain sends their ship flying. Chopper falls off and lands in the middle of a gathering of strange animals who conducting a mystical ritual! According to local legend, a king will fall from the heavens and become the ruler of the island! Unbeknownst to Chopper the evil hunter, Count Butler and his team of despicable henchmen, led by General Hot Dog and President Snake are searching this very island for the magical horn of the fabled King of the Animals! Oh oh! Will Luffy and his motley crew of Straw Hats find their new crew mate in time or is Chopper about to become more extinct than a giant rhino?